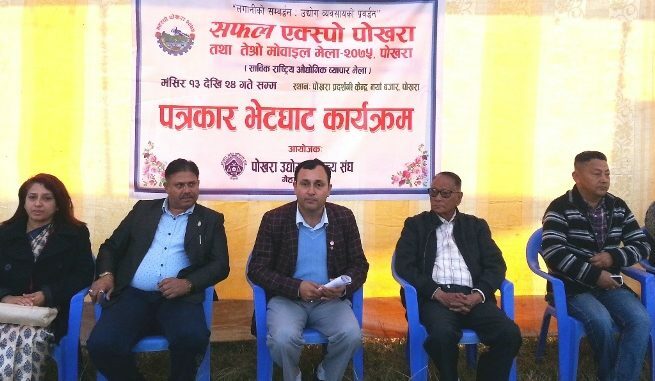 Pokhara—The preparation of Safal Expo Pokhara and third Mobile Festival 2075 has almost completed, informed organizer Pokhara Chamber of Commerce and Industry (PCCI) chairman Damu Adhikari in a press meet held at expo venue Pokhara Exhibition Center in Naya Bazaar on Tuesday. The expo begins on November 29 and ends on December 10. According to organizer, Gandaki Province Chief Minister Prithvi Subba Gurung will inaugurate the expo which would have 300 different stalls including 20 industrial ones. PCCI Chairman Adhikari said that the expo would be a meeting point of producers, traders and customers. He also sought the media support to make the expo a grand success. PCCI senior vice chairman Narayan Koirala claimed that the expo would help to promote the various brands and productions. According to him, the mobile festival would be one of the major attractions of the expo. Stalls of home stay, national and international products, garments, grocery items, automobiles, stalls flowers and electronic items are some of the key attractions of the expo. Stalls of industries, agro items, IT, handicrafts, health and tourism stalls are also the parts of the expo. Duet song competition, concerts and folk dance would also be added in the expo that would be visited by 0.2 million visitors. General ticket costs Rs 60 and student ticket is priced Rs 40. Rs one from every ticket would go for the child labor reduction program of PCCI. PCCI General Secretary Arjun Pokharel invited all the aspirants to visit the expo sponsored by Laxmi House and promoted by Nepal Tourism Board.